You are here: Home / All blog posts / A visit with Bhakti Ziek! A visit with Bhakti Ziek! We arrived at Boston’s Logan Airport on Tuesday night, and immediately boarded a bus for Hanover, New Hampshire. 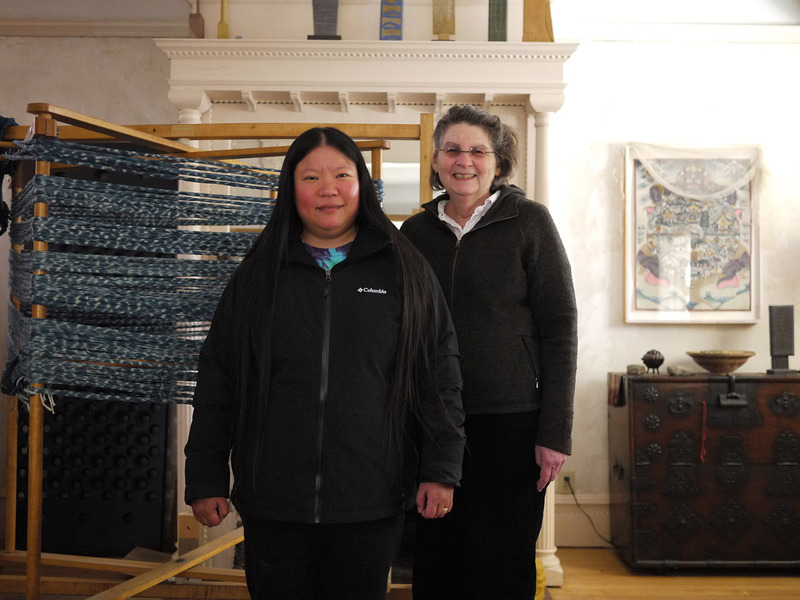 We crashed in a wonderful hotel (the Hanover Inn, on the Dartmouth College campus) overnight, then met up with well-known weaver Bhakti Ziek (co-author of The Woven Pixel), who graciously hosted us on Wednesday evening at her home in Vermont. Bhakti has a TC-1 jacquard loom (loom envy! loom envy!) and showed me some of her beautiful work. Alas, I neglected to take photos, but it’s both complex and beautiful – someday I want to weave like that! We had a great time, talking night and day about weaving, chocolate, philosophy, and all things creative. It was a wonderful visit and I’m looking forward to meeting up with Bhakti again in June, at ANWG. Bhakti then took us to the American Textile History Museum for the reception, where I finally got to see my wedding dress in its new home, at the wedding-dress exhibit. (See separate blog post about that.) It was a truly magical moment – unforgettable. We stayed overnight in a hotel near the museum, and this morning we’ll be flying down to New York City, to stay with my old, old friend Edouard. We’ve been friends since seventh grade – hard to believe it’s nearly three decades now! I haven’t seen him in some years, so it will be a real delight to see him. Mike will be in NYC through the 9th (when we fly home), but I’m jetting back to Boston on Sunday the 7th to do a presentation on the creative process, at the American Textile History Museum at 2pm. If you’re going to be in the area, come to the presentation! I’ll have a selection of my current body of work as well as many samples from the making of the wedding dress – a real cornucopia of textiles. Off to catch the shuttle to the airport!